Amara La Negra performs in Atlanta, Ga. in Feb. 2018. "If I say I'm Afro-Latina, you'll automatically, visually in your mind see [that] I'm dark," Amara tells NPR's Shereen Marisol Meraji. "And [in] my family we all speak Spanish, we're Latinos. This is my culture." While her distinct dancehall pop hooks and dembow rhythms have made hits out of songs like "What A Bam Bam" and "Se Que Soy," Amara's storyline on Love & Hip-Hop: Miami is proof of how difficult it can be for Afro-Latinas to make it in the entertainment business. Born in Miami, Fla., Amara La Negra grew up singing, dancing, and acting. "Performing is what I was born to do, but it hasn't always been easy," she says. Amara remembers dealing with racism and colorism in entertainment since pre-school. At 4, she won a competition that landed her on the the wildly-successful Hispanic variety show, Sábado Gigante. For the six years she was on the show, Amara says she was the only dark-skinned child in the cast and that producers would always place her either way in the back of the stage or smack in the middle "like a bug in the middle of a cup of milk." The comments about Amara's appearance from people working on the show were constant. Amara's mother was often told her daughter's hair was unmanageable and needed to be permed. "And I remember her looking at me and her face ... it was just letting me know that this was the beginning of the struggle," Amara says. After years of straightening perms, hot combs, and dieting Amara decided she was done policing her body. 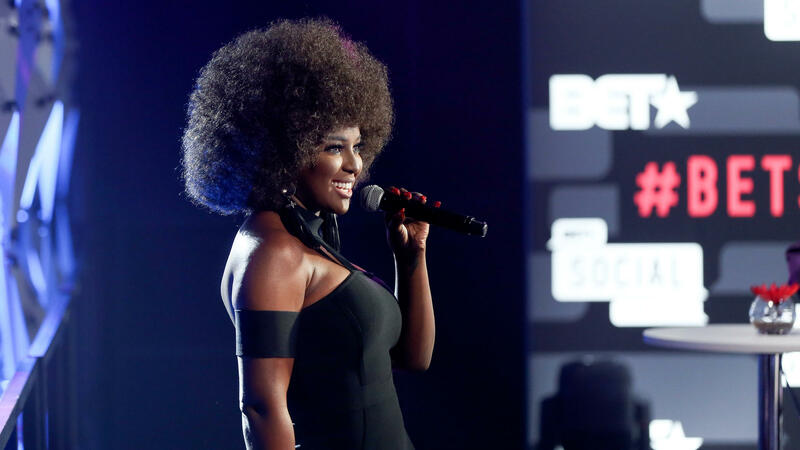 So she took the stage name Amara La Negra, "love the black woman," and embraced her afro. Amara's mother, Ana Maria, encouraged her daughter to embrace her natural beauty. As a native of the Dominican Republic, Amara's mother came to the U.S. and raised the singer on her own in Miami. Ana Maria worked multiple jobs — cleaning houses, cooking, selling flowers on street corners — to pay for Amara's dance classes and singing lessons. "I may have big dreams, but her dreams for me are even bigger," Amara says on Love & Hip Hop: Miami. Amara wants people watching her on TV to know that she doesn't live some fancy or glamorous life. More importantly, she wants people to know what she's up against in the music industry. She explains that racism and colorism run rampant in the business, and not just from white Americans, but from other Latinos, too. Amara proves this point early on the show when she meets with a Puerto Rican producer known as Young Hollywood. "Instead of asking me about my music ... he was too concerned about my hair," she says. He told her to look "a little bit more Beyoncé, a little less Macy Gray." The Young Hollywood debacle sparked a conversation about colorism and the racist notion of mejorando la raza within the Latino community. "I know that nobody wants to talk about it, but we suffer a lot of racism, we suffer a lot of colorism, amongst ourselves. You know, I get it all the time: 'Oh whenever you get married, don't get married to no black man because you want to better the race,'" she says. "Somebody needs to say something!" Adolfo Cuevas, a professor at Tufts University who studies the cumulative effects of racism on the health of Afro-Latinos, is Afro-Dominican like Amara and says that while there's not much data on Afro-Latino health, there are disparities between black and white Latinos when it comes to health outcomes. Even when black Latinos have received higher education than white Latinos, they are statistically less likely to be employed. And when they are employed, they make less money. Afro-Latinos also report having more health issues in general, and higher levels of depression. Amara La Negra thinks more positive media representation can help heal the Afro-Latino community. Growing up, she remembers that Afro-Cuban salsa singer Celia Cruz was the only famous Afro-Latina who looked like her that she had to look up to. "She was everything," Amara says. "She was loud ... she was very humble, she was an amazing person." Like Cruz, Amara La Negra wants to be a role model for Afro-Latinas coming up in the industry today. Now, with new multi-album record deal, a doll collection in the works, and (with fingers crossed) a shot on the big screen, Amara is working to bridge the gap. UNIDENTIFIED MAN: Flight 305 to Miami is now boarding. GREENE: ...VH1's "Love And Hip-Hop: Miami." The reality show follows the lives of artists and music industry folks as they break in, come back and cross over. It has been a big hit for the cable network, and this season, the breakout star is a Latina who wants Americans to know she's black and she's proud. I'll let Shereen Marisol Meraji from NPR's Code Switch team explain. SHEREEN MARISOL MERAJI, BYLINE: Dana Danelys de los Santos (ph), aka Amara La Negra, is black and proud. And, yes, she will say it loud. But don't take my word for it. AMARA LA NEGRA: I'm very loud so you should be able to hear me just fine. MERAJI: That's her talking to the sound engineer before our interview began. LA NEGRA: I'm very Latino. We need to - we need to be loud to know that you understand us. MERAJI: Amara La Negra is Dominican-American. Both her parents are from the Dominican Republic, and she was born and raised in Miami. LA NEGRA: So I am Afro-Latina. Afro-Latina means that I come from African descent, which means that I am black. Without you having to see me, if I say I'm Afro-Latina, you automatically visually in your mind see I'm dark. And my culture, my family, we all speak Spanish. We are Latinos. This is my culture. MERAJI: Simple enough, right? But her storyline on "Love And Hip-Hop: Miami" gets into how complicated it is when you're an Afro-Latina trying to make it in the entertainment business. And Amara does it all. She sings, dances and acts. LA NEGRA: Performing is what I was born to do. But it hasn't always been easy. You're too black to be Latina, or, you're too Latina to be black. Or, your hair is too nappy. You know, you need to be more petite, more skinny, more slim. Long legs, skinny. Don't do - it's your accent. It's everything. UNIDENTIFIED SINGERS: (Singing) Sa-sa-sa-sa-sabado gigante. MERAJI: ..."Sabado Gigante." She was on it for six years. And Amara says she was the only dark-skinned child, the only one, and they either put her way in the back or smack in the middle. LA NEGRA: Like a bug in the middle of a cup of milk like they don't know where to place you. And we don't want to seem racist, so we have to have her. MERAJI: As she says the comments about her hair were constant. LA NEGRA: I was getting my hair done backstage, and the hairstylist told my mom, you need to perm her hair. You need to do something about her hair because her hair is unmanageable. We cannot deal with this. We don't have time for this. I remember my mom looking, her facial expression, that moment. I was, like, about 5 - 5 or 6. And I remember her looking at me, and her face, it was just letting me know that this is the beginning of the struggle. MERAJI: It was years of straightening perms and hot combs and dieting. And so she was like, I'm done. LA NEGRA: All right. That's it. Take it or leave it. MERAJI: And Amara La Negra - Love The Black Woman - was born. She was 17 when she said, I'm going embrace my skin, my curves and my hair. Her signature style? A big, beautiful afro. Her mom totally supported the decision, and their relationship is a big part of Amara's "Love And Hip-Hop" storyline. LA NEGRA: I may have big dreams, but her dreams for me are even bigger. MERAJI: Her mom, Ana Maria, came to the U.S. from the D.R. almost 30 years ago. She raised Amara on her own in Miami, worked multiple jobs cleaning houses, cooking, selling flowers on street corners to pay for her daughter's dance classes and singing lessons. Amara says she wanted to show people watching her on TV that she didn't live some fancy, glamorous life. And more importantly, she wanted them to see what she was up against. LA NEGRA: My mom works in a kitchen. I've been working on my career since I was 4 years old, and I still haven't made it to where I want to be. Why haven't I made it? What is going on? MERAJI: Racism and colorism, she says, and not just from white Americans, from Latinos, too. She proves her point early on in the first season of "Love And Hip-Hop: Miami" after a meeting with a producer. He's Puerto Rican, and he goes by the moniker Young Hollywood. She's hoping he'll help her cross over from the Latin to the American music market. LA NEGRA: It was his natural reaction that instead of asking me about my music, what direction I wanted to go, what I wanted to do. He was too concerned about my hair. MERAJI: He told her to look more Beyonce and less Macy Gray. And if you don't get that reference, it basically means straighten your hair. And Amara says that means look less black. LA NEGRA: So I can't be elegant if I have a 'fro? Is that what you're saying? YOUNG HOLLYWOOD: Yeah. I guess so. MERAJI: People on social media skewered Young Hollywood and rushed to Amara's defense. He denies he's racist, saying he didn't properly articulate what he really wanted to say. Either way, it opened up a very touchy conversation about colorism within the Latino community. LA NEGRA: I know that nobody wants to talk about it, but we suffer a lot of racism. We suffer a lot of colorism amongst ourselves. You know? We'll say it all the time. If you want to argue with me, the first thing they'll say is, la negra esa - the black this, or the black da-da-da-da-da. You know? I get all the time, whenever you get married, don't get married to no black man 'cause you need to better the race. You don't want nappy hair. You don't want a big nose, big lips. You don't want - so it's just that self-hate that has been taught generations through generations that is just awful. Somebody, somebody needs to say something. Like, are we just going to keep hearing it and not do anything about it? MERAJI: So I spoke at length with Adolfo Cuevas. He's a professor at Tufts University, and he's studying the cumulative effects of racism on the health of Afro-Latinos. He's Afro-Dominican, like Amara La Negra, and he says there's really not that much data on black Latinos. But what is out there shows big disparities between black and white Latinos. Even when black or Latinos have more education than white Latinos, they're less likely to be employed. And when they are employed, they make less money. Afro-Latinos also report having more health issues and higher levels of depression. Now, Amara La Negra thinks more positive media representation can really help. She says when she was growing up, the only person she had to look up to was the Afro-Cuban singer Celia Cruz. LA NEGRA: Azucar. I used to love her. She was everything. She was loud, and her charisma - she was very humble. She was an amazing person. When she passed away, I was like, well, then there's nobody else that I can be like. MERAJI: Amara La Negra says she really wants to be a role model for Afro-Latinas coming up today. She just signed a multimillion-dollar record deal. She's got a doll collection in the works, and she says - fingers crossed - she'll be on the big screen, too. And she ended our interview by shouting out the Afro-Latina in her life who made it all possible. LA NEGRA: Mommy. Mommy, I love you so much. Thank you. I can't wait to go home to give you a hug. I miss you so much. OK. (Laughter). MERAJI: Shereen Marisol Meraji, NPR News. LA NEGRA: (Singing in Spanish). Transcript provided by NPR, Copyright NPR.